Jerome N. “Jerry” Norman, 82, of Thomas Circle, Port Washington died August 10, 2003 at Columbia St. Mary’s Hospital, Ozaukee Campus in Mequon. He was born January 8, 1921 to George T. and Mary Mueller Norman in Grafton, WI and moved to Port Washington as a young boy. He worked at Ewig Bros fisheries and the former Kwik Mix, Port Washington before the war. When he returned, he married Marion Ewig of Port Washington, WI on April 24, 1946 at St. Mary’s Church in Port Washington. He joined his father & Walter Gantner in 1950 at Gantner-Norman Insuance Agency in Port Washington which was started in late 1920’s. He took over the business in 1961 and in 1984 sold it to his son Bob. 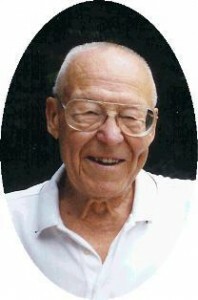 Jerry continued to work until his retirement at the age of 80 in June, 2001. He was a member of the Van Ells-Schanen American Legion Post 82, Loyal Order of Moose Saukville Lodge 1043, former member of Port Washington Rotary for many years and a charter member of the Port Washington Auxilliary Police from the 1964 Tornado. He was a truck driver for the former Railway Express Company, Port Washington and hearse driver for the Poole Funeral Home for over 30 yrs. Jerry enjoyed bowling, fastpitch softball and hardball and especially playing cards including bridge, sheepshead and pinochle. He had a heart of gold, a husband, a dad, a grandfather and a loved friend! He always said to his grandchildren to “put it in writing”. So from the grandchildren-Grandpa, we “put it in writing”, we love you. He is survived by his wife Marion (nee Ewig) of Port Washington, children Georgine Norman of Alpharetta, GA, Jim (Susan) Norman of Portland, OR, Mary (Mike) Ratatori and Bob (Karen) Norman both of Port Washington, WI. Further survived by grandchildren Jennifer & Kristin Ratatori, Brian, Erica and Jessica Norman, brother-in-law of Bob (Betty) Ewig of Port Washington, WI other relatives and friends. He is preceded in death by his parents George and Mary Norman and his in-laws Herbert and Gertrude Ewig. Funeral services 10:30 AM Friday at St. Mary’s Church Port Washington. The Rev. James Ernster celebrant. Interment parish cemetery. Visitation 4 – 7 PM Thursday at the Poole Funeral Home with a 4 PM rosary and 7 PM Legion vigil. Memorials appreciated.